More than a cookbook...it's also the story of how a farm came to be. 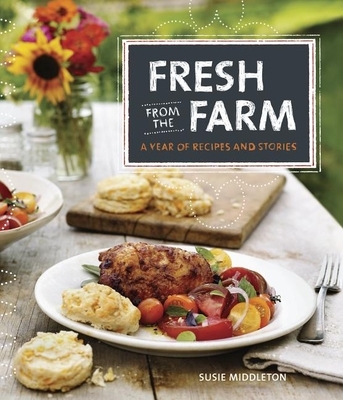 Written by the "Queen of Fresh" Susie Middleton, Fresh from the Farm goes beyond traditional "fresh" cookbooks by sharing the engaging tale of one woman's quest for a simpler life. In between the recipes, Susie shares the story of how she left the corporate world, started a farm on Martha's Vineyard, and created a satisfying new life on this rural island. embraces the family farm angle." Susie Middleton is not only a cook and a writer, but a farmer, too. The former chief editor of Fine Cooking magazine, Susie also authored Fast, Fresh & Green and The Fresh & Green Table. Susie has been a life-long writer, and in addition to blogging regularly at www.sixburnersue.com and occasionally on the Huffington Post, she writes both essays and food features for national and regional magazines. She started growing vegetables commercially in 2010 on Martha's Vineyard.